A man is facing federal charges in the shooting of a United States Postal Service worker Monday night in Elk Grove Village. ELK GROVE VILLAGE, Ill. (WLS) -- A man is facing federal charges in the shooting of a U.S. Postal Service worker Monday night in Elk Grove Village. Cameron Ruebusch has been charged with assaulting a postal employee by the United States Postal Inspection Service, according to a complaint and affidavit filed Wednesday. Ruebusch, 24, has been in the custody of the Cook County Sheriff's Office three times since 2017, the office said. On May 5, he was charged with manufacturing/delivery of cannabis; on July 26, 2017, he was charged with assault; and on March 15, 2017 he was also charged with IOassault. Investigators said 36-year-old Stephen Casazza, Jr., parked his USPS vehicle, an unmarked red Dodge Caravan, in front of a home in the 200-block of West Brantwood Avenue around 6 p.m. Monday to deliver mail on that street, according to the complaint. 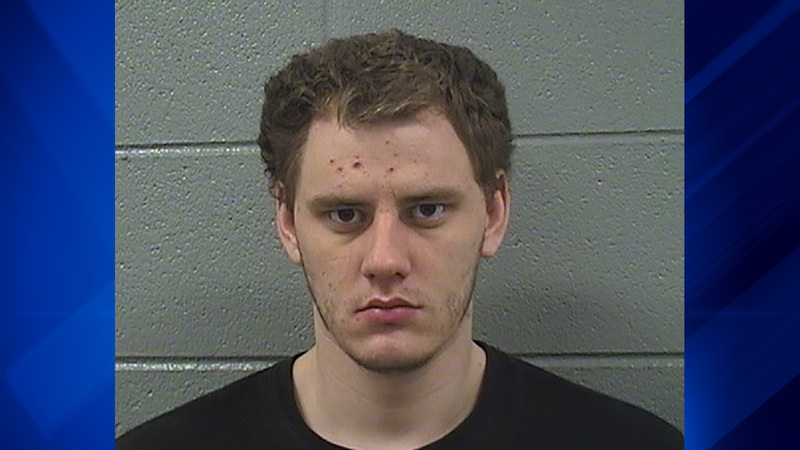 A May 2018 booking photo of Cameron Ruebusch. According to investigators, Casazza had just gotten back into his car following that delivery and started the engine when a white male wearing a baseball hat, who investigators identified as Ruebusch, tapped on the front passenger window to get his attention and said "What's up, man?" Investigators said when Casazza looked over he saw a handgun and immediately drove away eastbound on Brantwood Avenue. As he was driving away, Ruebusch allegedly opened fire, striking Casazza multiple times, including in the right shoulder. Casazza was taken to Lutheran General Hospital for treatment. He is recovering from surgery after being shot multiple times in the back, chest and arm. "Unbelievable," said Stephen J. Casazza, Sr., the victim's father. "He is incredibly lucky, and I hope he realizes that God gave him another chance." Casazza, Sr., said his son has no idea why he was shot, and that he has a long recovery ahead of him. "It's going to be a long road for him and us," Casazza, Sr., said. Authorities said the shooting happened in front of Ruebusch's home. Maria Pignato, a neighbor, came out to help after she heard the shots. She and the other woman talked to Casazza, trying to keep him awake before an ambulance arrived. "So I just went up to him and held his hand. I asked him what his name was, asked him if he had a family," Pignato said. "I was just trying to talk to him to help keep him conscious because it was pretty bad." Authorities said multiple witnesses identified Ruebusch as the suspect. Police also said that he may have tried to hide the gun in nearby Busse Woods Forest Preserve. "Very appreciative of the Elk Grove police and the federal police, postal police," Casazza, Sr., said. "And these postal workers, these letter carriers, they're out every day in all kinds of different weather and neighborhoods. You've got to commend them." This was the first known shooting in Elk Grove Village in nearly two years, police said.